I have a complicated relationship with collectibles (read: licensed toys that are in some way targeted to adult collectors). It was back in my teenage days when I started feeling the pressure from my family that I should stop buying…well, toys. It was the ’90s, so I had a lot of Teenage Mutant Ninja Turtles, G.I. Joes and Jurassic Park toys, and as I grew older it became clearer that I was not going to play with them anymore, so I didn’t mind that much whenever I learnt that some of them were given away to a nephew or some kid out there. And while I stopped buying toys or collectibles for a while, that didn’t mean that I stopped liking them, and over and over I used to browse the toys aisle any chance I got. As time went on—then officially an adult—I went back to buy just a few under the guise of collectibles; it started with small things I could display on my bookshelf, Star Wars action figures and spaceships became a perfect example of this, the spaceships from Micro Machines are actually the only ones I can say I tried to get as many as I could, and I did end up getting quite a few. Alright! Remember Micro Machines? I got this much! Videogame-related collectibles on the other hand were an entirely different thing—back then it was really difficult to find anything related to your favorite videogame series or characters, and when you did find something, it probably had an impossibly expensive (yeah, this come from Japan) price tag. Things have changed a lot these days. Back when I was younger I would have never dream of finding my videogame series or logos plastered on a notebook or a backpack, even less seeing actual action figures based on them, at least an affordable price. Actually, videogame collectibles have became harder to ignore; nowadays game themselves come packed with collectible special editions, and any popular videogame series will find a deal in order to become a toy, an action figure, or any other sort of collectible. I have my fair share of videogame-related stuff in my collection, but at some point I decided I should curb the amount of stuff I got because I was eventually going to run out of space to display them. That didn’t happen to my Halo Mega Bloks (now Mega Construx) collection, though. Actually, it wasn’t “a collection”, and my favorite part about it is that there’s a story about how I did get many of them, which takes me back at how I got the first one back in 2009, precisely now that the brand is celebrating its 10th Anniversary. Now, for those of you who don’t know me enough, Halo is one of my most influential games since the release of the first title of the series: Halo: Combat Evolved. The game had a fresh and accessible action-oriented gameplay that I didn’t know I needed back when it came out, not to mention it’s packed with the kind of lore and science fiction that I usually geek out about in media. 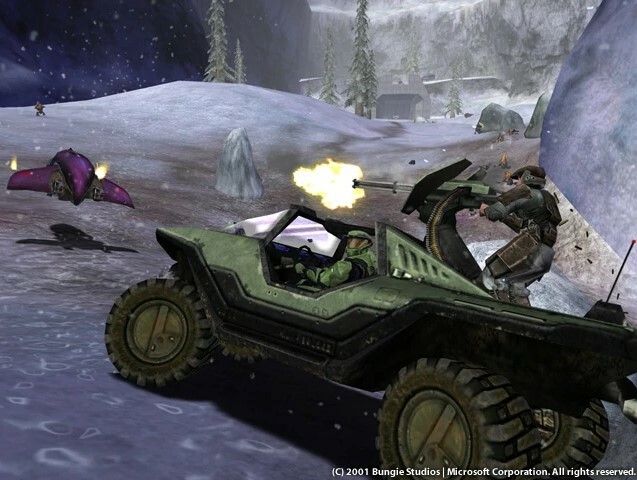 Of course, the series also has a good dose of the vehicular combat which I need as part of my gaming diet. By that time I had already bought a few collectibles based on the series, but I was on the fence about whether I should buy any of those early Mega Bloks that were released in 2009 (during the times of Halo Wars‘ release). The vehicles indeed looked cool, but they were not something I could just buy and display on my desk as usual; these were actual toys I needed to find some time to actually assemble first. I ended up getting my first model—that Warthog from above—but the thing is…I didn’t get it myself. It was a birthday present from (the one who would later be) my wife. Somehow she must have known how much I wanted it (that wandering and staring into the toys aisle probably gave her a hint), and that meant she knew me enough to know I wanted it, and…you know? That’s when I realized why some people make a big deal about a presents. While some people people might say that we’re delving into consumerism or whatever, sometimes physical presents can store a memory of a specific time and place, and the iconic Warthog does that for me. The real drive down through memory lane came during the Warthog assembly. I made time the very next day to put it together, and that reminded me how much I loved building things, and how much I enjoyed these kind of toys when I was a kid. Back then, we didn’t have Lego in my region—we had Tente—and I remembered how much fun I used to have both playing alone or with my friends or relatives. Actually, Tente had a great line of military vehicles which were among my favorites, so piecing the Warthog together felt a lot like home. It probably took me an hour or two to finish it up, but the point is that it felt great, so I proudly displayed the Warthog on a shelf once I was done with it. “Why do we have to stop doing fun stuff as we get older?” I wondered. 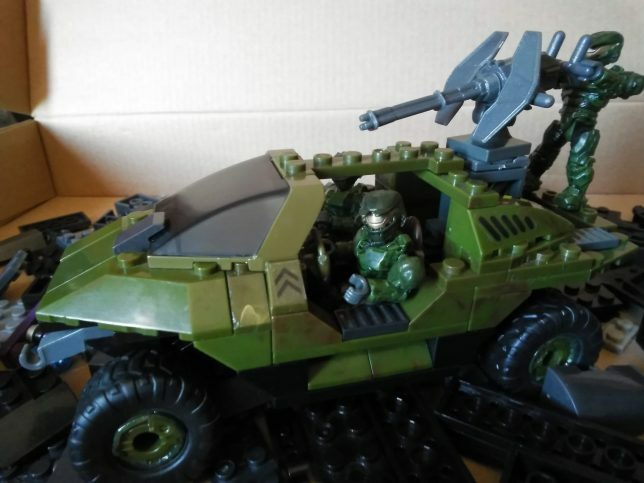 As you may realize, this was the first model in my Halo Mega Bloks collection, but not my last. On the other hand, the Warthog was one of the few models I did piece together, while the rest of my collection kept piling on top of my furniture. This year I finally decided to assemble a few of them—lowering the chances of trampling on them and dying buried under an always-growing tower of collectible shame. But I also wanted to give them a purpose, so I figured I could share them along with my never-ending need to talk about the Halo series. Want to learn how far I got into my collection? …there might be some twists and turns along the way, so stick around if you’re up for a ride down memory lane.